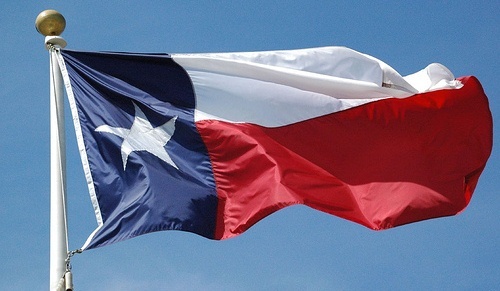 For some Texans, it’s the most important day of the year, and a holiday that no other state can claim. March 2nd is Texas Independence Day, and its observance on the University of Texas campus began with some tenacious students, a missed class, an afternoon spent at Scholz’ Beer Garden, and a very noisy cannon. 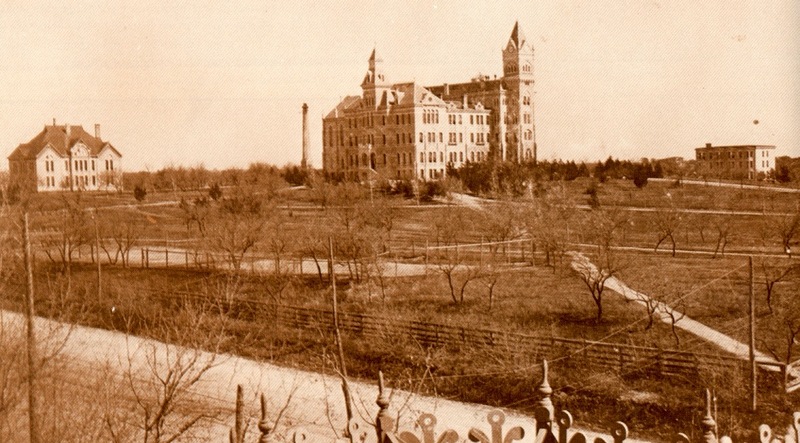 In the spring of 1896, the fledgling University was confined to a 40-acre campus, with a white-washed wooden fence around the perimeter to keep out the town cows. A Victorian-Gothic Main Building, only two-thirds complete, commanded the hill in the center. It was flanked by the Chemistry Lab Building to the northwest, and B. Hall, a men’s dorm, down the hill to the east. The University’s 482 students were divided into two departments: Academic and Law. The Academic Department encompassed studies comparable to today’s Colleges of Liberal Arts and Natural Sciences, and the “Academs,” as its students were known, pursued their classes for the usual four years, most leading to a Bachelor of Arts degree. Law students, though, needed only two years to complete an LL.B. – a Bachelor of Laws and Letters – and a previous undergraduate degree wasn’t required for admission. Junior Laws were first-year law students and often the same age as other UT freshmen, while Senior Laws were completing their final year. 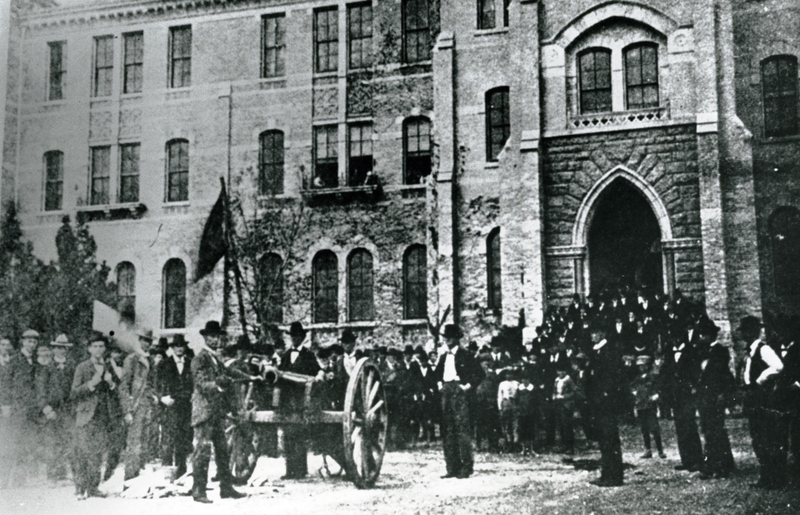 On the cloudy, warm, and humid morning of March 2, 1896, the Junior Laws were waiting for their next lecture in criminal law, taught by Judge Robert Batts, when one student bemoaned the fact that the day was Texas Independence Day, a legal holiday for Texans, except, apparently, for those on the University campus. Winston’s Academy experience also taught him to be a thoroughly patriotic American. He neither understood nor shared the affinity Texans had for March 2nd, recognized only one Independence Day, and that was on July 4th. Undaunted, the Senior Laws pressed ahead with their plans, hoping to impress upon the president the importance of the second day of March. Working with the Texas Attorney General, four of the students signed a bond in order to borrow one of the two brass cannons that stood guard – and are still on display – in front of the State Capitol. It took most of the afternoon of March 1st to roll the cannon to the Forty Acres, where the Laws planned to use it for a 21-gun salute to Texas at dawn the following day. Just before sunrise on March 2, 1897, the Senior Laws arrived, anxious to start the festivities, only to discover that the cannon had been spiked. A large nail had been driven in to the ignition hole, and it took some time, persistence and the employment of several pocket knives to remove the offending item. By then, President Winston had arrived on the scene, and was rather unhappily resigned to the fact that the students were going to celebrate, whether or not the faculty approved. (Years later, Winston finally admitted that he had spiked the cannon himself!) Hoping to minimize the damage to the class day, Winston asked the Laws to move the cannon away from the Main Building, down the hill to the University’s athletic field, about where the O’Donnell Building and the Gates-Dell Computer Science Center now stand. Or, they could wait until after noon to have their fun. The students elected to do both. Boom!! Starting at 9:30 a.m., an otherwise peaceful March morning was harshly interrupted by a series of cannon blasts from the athletic field. 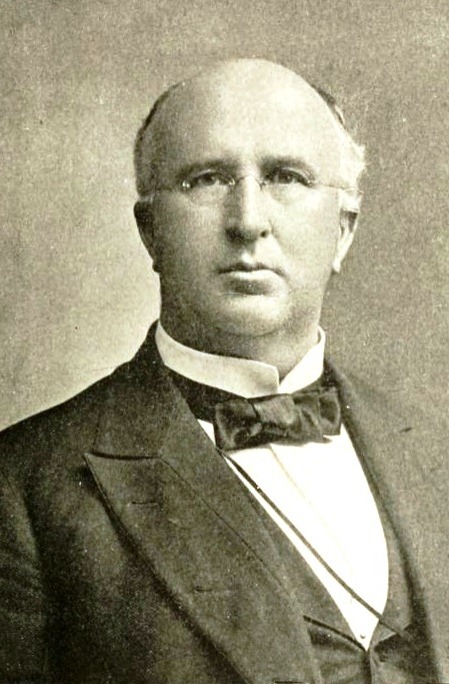 The entire Law Department attended, including Professors Robert Batts and John Townes, and following the cannon fire, each person present gave a short but sincere patriotic speech. The talks by Batts and Townes were greeted with particularly loud cheers from the students. Meanwhile, a distracted Academic Department continued to hold classes as best as it could in the old Main Building, some of the faculty hoping the Laws would tire of their efforts, while other professors were no doubt wishing they could join in the fun. The Laws, though, weren’t going to allow Texas Independence Day to pass without including the rest of the University. At 1 p.m., a fresh supply of gun powder was secured, and the cannon was dragged up the hill and positioned directly in front of the Main Building, facing the Capitol. Boom!! The first blast “threatened to break every window in the building,” claimed an eyewitness. In a flurry, the Academs vacated their classrooms and joined the Laws outside and the scene of the morning was repeated, with more speeches from students and professors. Varsity! Varsity! U. T. A.! Today, the on-campus celebration is limited to a popular annual breakfast hosted by the Tejas Club, and attended by the UT president, faculty, staff, and invited graduating seniors, though alumni chapters worldwide join in on the fun, and organize events that raise funds for UT scholarships. 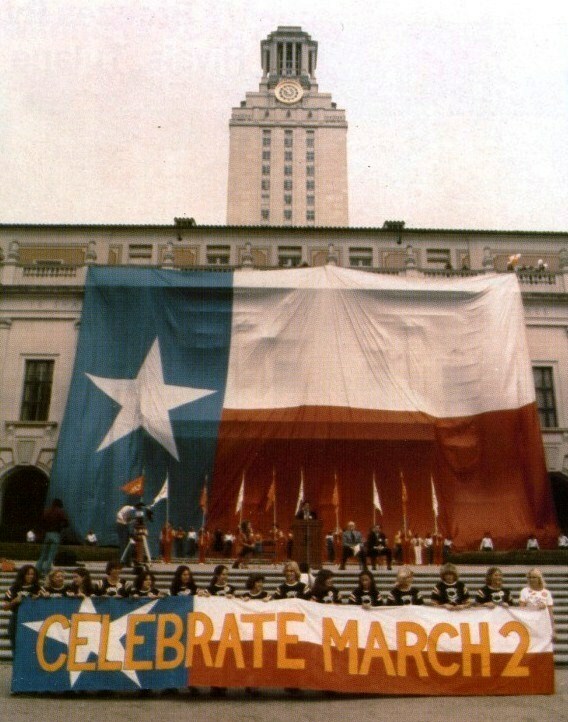 Above: In the 1980s, Texas Independence Day was remembered on the Main Mall at noon with members of the Longhorn Band, Alpha Phi Omega’s “world’s largest Texas flag” draped in front of the Main Building, and Texas birthday cake served by the Orange Jackets women’s service organization. To continue the 1897 tradition, the Texas Cowboys fired Ol’ Smokey, the cannon used at football games. The image above is from 1981. This entry was posted in Uncategorized and tagged Day, George Winston, Independence, Jim Nicar, Orange Jackets, Tejas, Texas by jimnicar. Bookmark the permalink.